The following management recommendations consider the SNAMP focal resources as an integrated group. These recommendations were developed by the UC Science Team working together. Although each recommendation was written by one or two authors, the entire team has provided input and critique for the recommendations. The entire UC Science Team endorses all of these integrated management recommendations. I recently adventured into science journalism with a piece describing our recent article in PNAS detailing changes in forest structure over the 20th century. I talk about the use of the old data, and what the implications are for these changes. Check it out! This change to the forest landscape is important not only to the people of California. Large trees are huge sinks of carbon dioxide, provide habitat for many creatures and play a vital role in the water supply by, for example, providing catchment areas for snow. Forests that are denser with smaller trees are also more likely to burn. 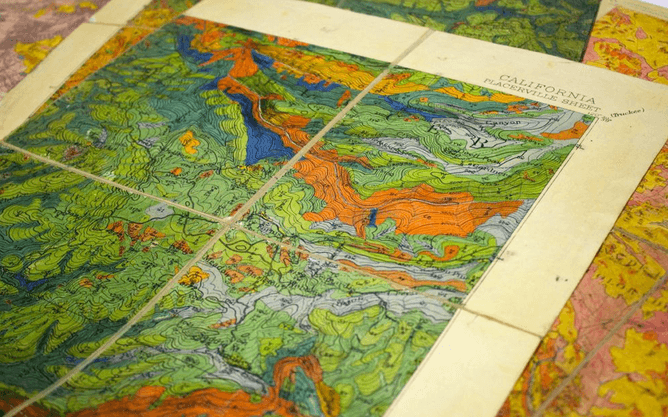 This botanical map was pioneered by Albert Wieslander, an employee of the Forest Service Forest and Range Experiment Station in Berkeley, California. The collection consists of 18,000 detailed vegetation plots, over 200 vegetation maps, 3,100 photographs and hundreds of plant specimens. Overall, the collection covers about 280,000 square kilometers, or just over a third of the state. 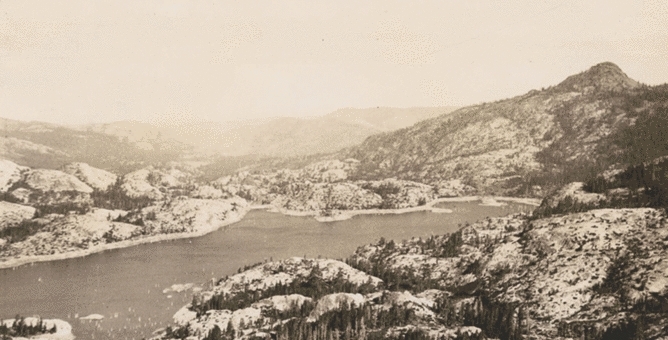 Combined, the data created a detailed picture of the state’s vegetation in the early 20th century — an important marker ecologists today can use for comparison. During the 2000s, several groups, including my lab, launched efforts to digitize the plot data, maps and photograph portions of the collection. There still are some missing pieces. Indeed, the journey from paper collection to digital data has been a long one, with several cases in which documents were nearly destroyed either intentionally or by accident. It’s a cautionary tale about the importance of rescued and shared historical data in ecological and geographical analysis. In our large trees study, we wanted to look at forest structure throughout the state by comparing the 1920s and 30s data with contemporary data collected through the Forest Inventory and Analysis (FIA) program. 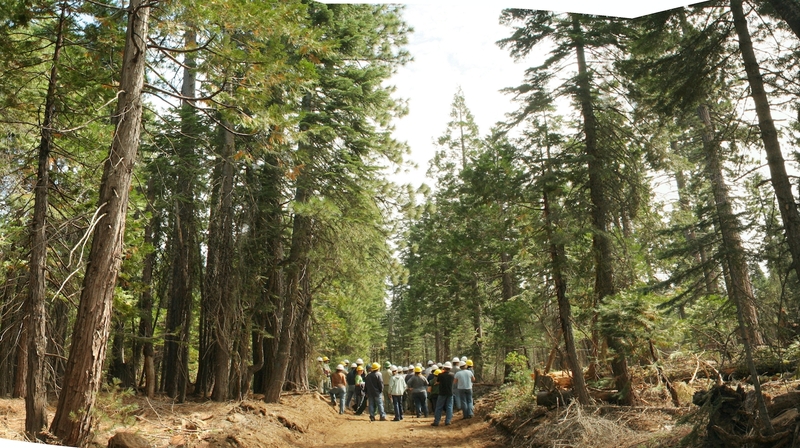 The FIA program is similar to the VTM project: Forest Service crews report on the species, size, and health of trees across all forest land ownerships. Our study was comprehensive, covering the five ecological regions of the state - over 120,000 square kilometers in total – and took into account land-management and land-use history. Why this shift from fewer large trees to more smaller trees? Water stress seems to be the best explanation for the pattern we observed. Water stress in a forest is caused by a combination of rising temperatures, which cause trees to lose more water to the air and to earlier melting of snowpacks, which reduces the amount of water available to trees. And indeed, large tree declines were more severe in areas experiencing greater increases in water deficit since the 1930s. Large trees, in general, seem to be more vulnerable to water shortfalls. This might be because larger, taller trees have trouble getting water to the tops of the trees when water is short, a phenomenon being studied by many tree physiologists. It might also be that these big trees – some likely 300 years old or more – grew up in a different, colder and moister climate. Regardless of the reasons for large tree decline, we likely can expect more water stress in California from rising global temperatures. Apart from the fact that we tend to love and admire our emblematic large trees, they also serve very important roles in the forests. And changes to forest structure – a shift to fewer large trees and more smaller trees – are important for us to pay attention to. Forests with large trees store more carbon; groups of larger trees provide preferential habitat for many species; forest structure impacts the way fires burn and impacts the way forests store and release water. These changes are a warning of possible changes to come. The loss of these trees, for example, would take away a massive carbon sink, change the way wildlife use these forests, and change the way they burn. Jepson, W. L., R. Beidleman, and B. Ertter. 2000. Willis Linn Jepson’s ‘‘Mapping in Forest Botany’’. Madroño 47:269–272. 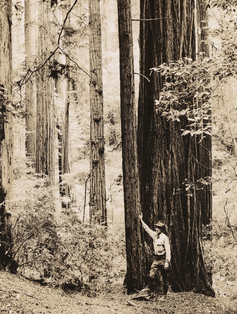 Some press on our PNAS paper: Twentieth-century shifts in forest structure in California: Denser forests, smaller trees, and increased dominance of oaks. Statewide, tree density in forested regions increased by 30% between the two time periods, and forest biomass declined by 19%. Larger trees (>60 cm diameter at breast height) declined, whereas smaller trees (<30 cm) have increased. Large tree declines were more severe in areas experiencing greater increases in climatic water deficit since the 1930s. Forest composition in California in the last century has also shifted toward increased dominance by oaks relative to pines, a pattern consistent with warming and increased water stress, and also with paleohistoric shifts in vegetation in California over the last 150,000 years.